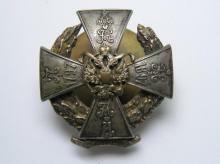 Officer Badge of Siberian Cossack Army. 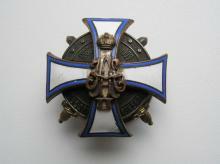 In Bronze and Silver,enamels. By Kortman. 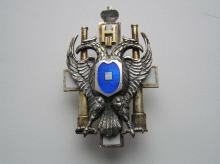 Badge for Graduation from Chughuev Military School, by Kortman, in silver and enamels. 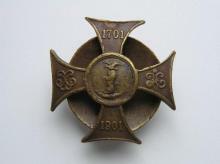 Officer Badge of Centennial of the Local Troops. 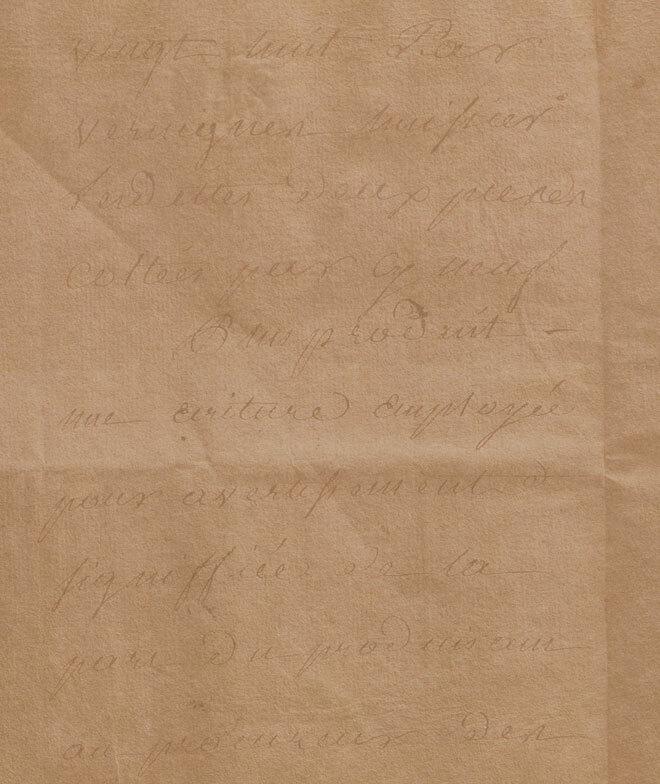 In bronze-gilt. In silver, gold, enamels. 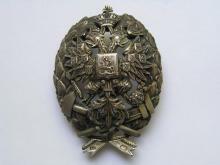 1st Kiev Konstantinovsky Military School Graduate Badge Provisional Government Period. 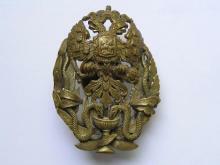 In white metal and bronze, gilding, silvering, enamels. Rare. 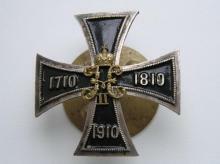 Officer Badge of the 14th Olonets Infantry Regiment. Bronze, gilding,enamels. Perfect condition. 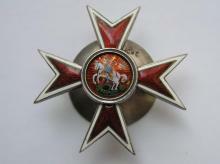 Officer Badge of the 148th Caspian Infantry Regiment. Bronze, silver, gilding,enamel. 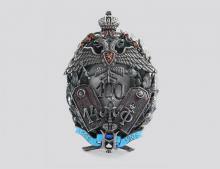 Badge of the 56th Zhitomir Infantry Regiment of His Imperial Highness Grand Duke Nikolai Nikolaevich. 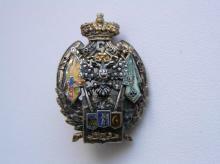 In bronze-gilt, enamels. By Eduard. 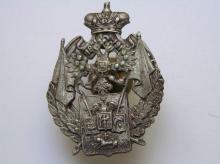 Tail-coat Officer Badge of the 132nd Bendersky Infantry Regiment. 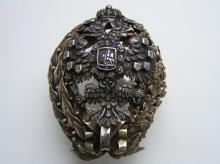 In silver, gilding, enamels. 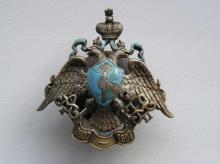 Jubilee badge of the Imperial Military Medical Academy. Bronze, enamels. 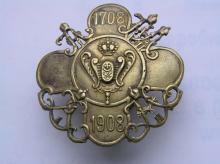 Mikhailovsky Artillery School in St. Petersburg Graduation Badge. 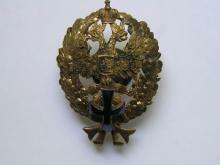 In bronze-gilt, enamels. By Eduard. 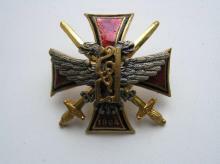 Badge of Alexeevsky Military School. 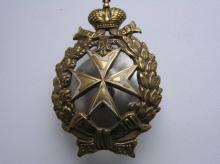 In bronze, silver,gilding, enamels. # 1411. 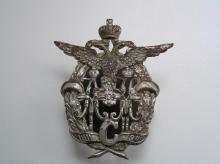 Badge of Alexeevsky Military School Provisional Government Period. 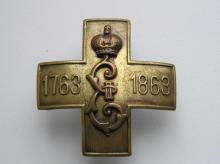 In bronze, silver,gilding, enamels. Rarity. 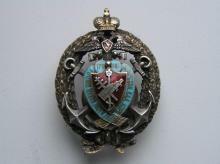 Badge of the Nicholas General Staff Academy. In silver. 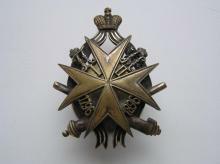 Infantry Ensign School Graduation Badge. Provisional Government, 1917. In bronze , gilding, enamels. 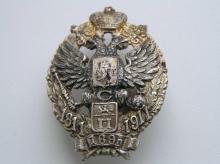 Badge of the 13th Belozersk Infantry Regiment. In Bronze, silvering. Good condition. 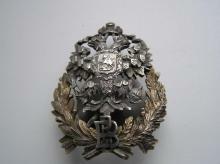 Badge of the 13th Belozersk Infantry Regiment. In Bronze, silvering. 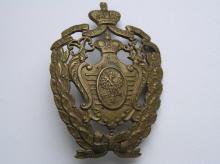 Badge of the 28th Polotsk Infantry Regiment. In white metal. 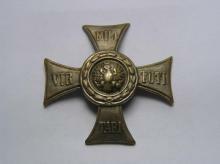 Badge of the 122nd Tambov Infantry Regiment. In bronze, silvering. 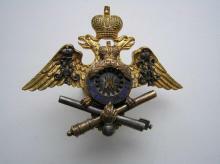 Badge of the 34th Sevsk Infantry Regiment. In Bronze. 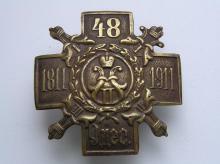 Badge of the 48th Odessa Infantry Regiment. In Bronze. 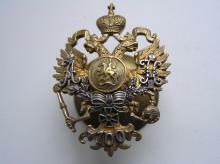 Badge of the 10th Odessa Uhlan Regiment. 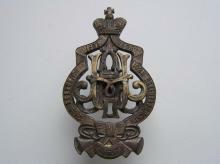 In bronze and metal. By Eduard. 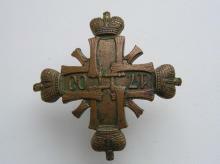 Badge of the 29th Chernigov Infantry Regiment. In Bronze. 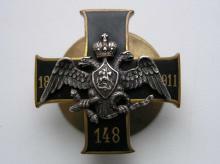 Badge of the 132nd Bendersky Infantry Regiment. In white metal. 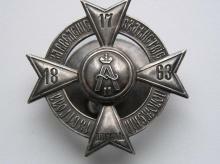 Badge of low ranks of the 4-th battery of the 1st Artillery Brigade. In bronze, silvered, enamels. Rarity. 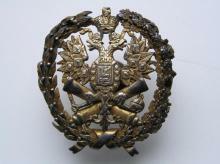 Low ranks badge of the Imperial Guard Fleet, in bronze, gilded, silvering, paint, by A.Kortman. 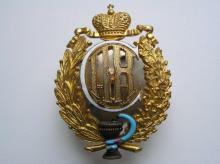 Badge of the 85th Vyborg Infantry Regiment. In bronze, gilding. By eduard. 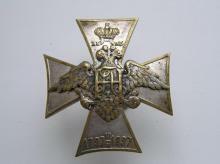 Badge of the 2nd Sofia Infantry Regiment. In white metal. 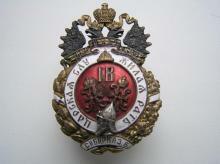 Badge of the Mikhailovsky Artillery School, # 13. In silver, gilding. Rarity. 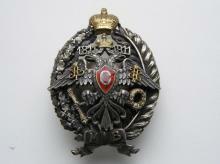 Badge of the 62nd Suzdal Infantry Regiment. In Bronze, gilding, silvering. By Kortman. 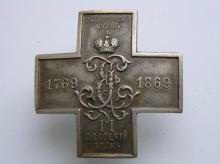 Badge of the 169th Novo-Troksk Infantry Regiment. In Bronze, gilding, silvering. 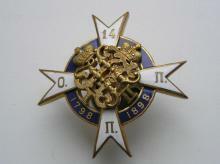 Tiflis Military School Graduate Badge, in silver, gilding, enamels. 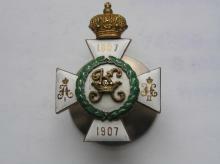 Badge of the 101th Perm Infantry Regiment. In Bronze. 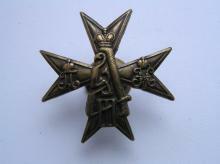 Badge of the 24th Simbirsk Infantry Regiment. In white metal, silvering. 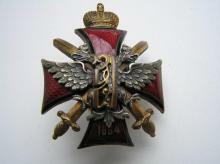 Badge of the 145th Novocherkassky Infantry Regiment. In Bronze. 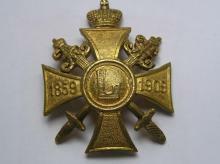 Badge of the 183th Infantry Regiment. In Bronze, silvering. 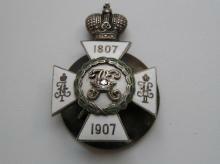 Badge of the 90th Infantry Regiment. In Bronze. 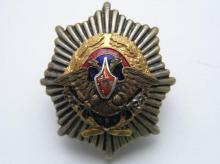 Badge of the 94th Infantry Regiment. In Bronze. 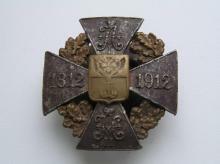 Badge of the 123th Kozlovsky Infantry Regiment. 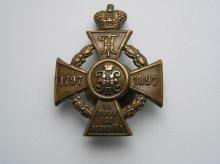 In Bronze, white metal. 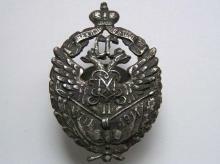 Veterinary badge. In silver. "Г.Р." mint. Hand made!!! 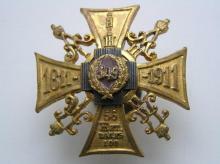 Badge of Centenary of the Ministry of Defence. In bronze, silvering, gilding. 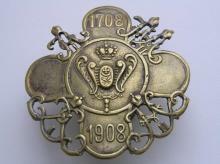 Badge of the 12th Belgorod Uhlan Regiment. In bronze. 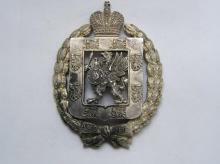 Badge of the 103rd Petrozavodsk Infantry Regiment. In Bronze, gilding, silvering. 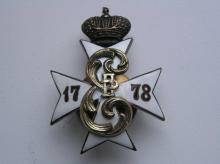 Soldier’s Badge of the 118th Shuisky Infantry Regiment. 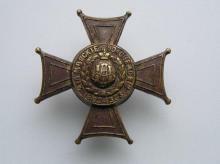 Badge for doctors which had degree of physician. 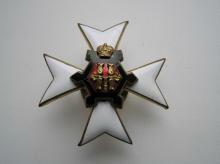 Presented to military doctors-graduators of medical scool. Bronze, gilding, enamel. 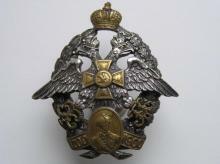 The badge "Alexander II Reform". Silver. St. Petersburgh. The middle of the 19th century. Fine condition. 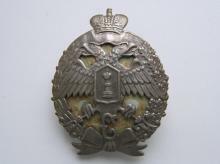 Badge of Kazan Military School. 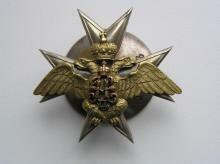 Bronze-gilt, enamels, silvered. Rarity. 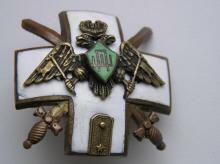 jeton of the Imperial Special Committee for the Strengthening of the Air Force, bi Eduard of St.petersburgh, in silver, with enamelled scroll. 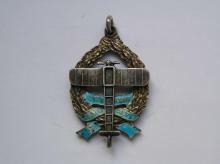 Nikolaevsky School of Engineers in St. Petersburg Graduation Badge. 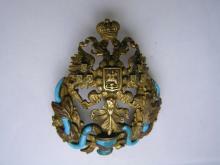 In bronze-gilt, enamels. 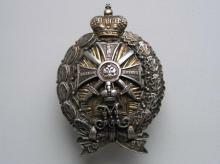 Officer Badge of the 54th Minsk Infantry Regiment. 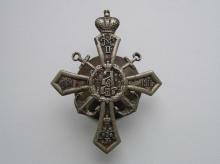 Silver, enamel.